As a leading floral event design company based in Dallas and Atlanta, Jackson Durham is led by Sara Fey Egan, Heath Alan, and Charles. 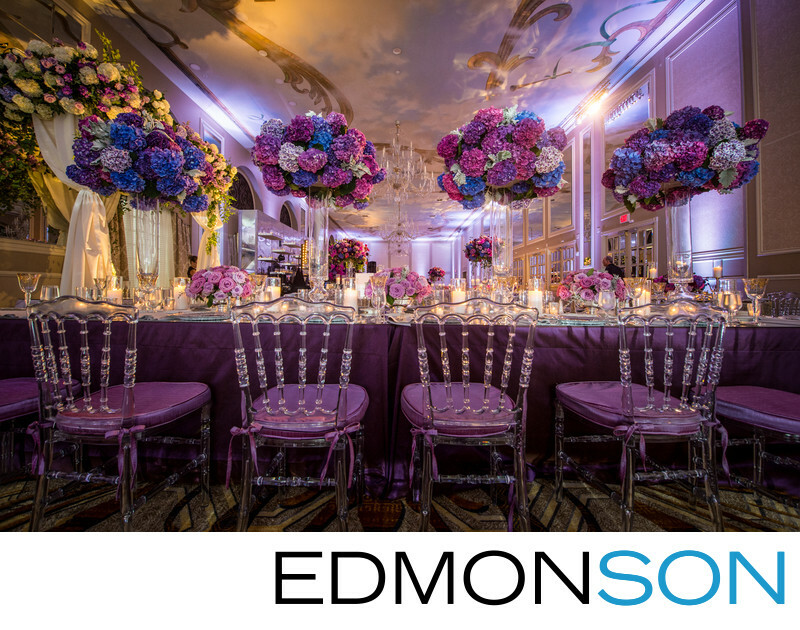 In this wedding reception photo taken inside the Adolphus Grand Ballroom, traslucent "Ghost" chairs are arranged around mirrored tables wiht purple, blue and white hues and flower centerpieces. Also shown on the left is a custom cake table with a canopy of floral arrangements across the top. Contact Jackson Durham through their website or by calling 214-780-0257 to make a consultation for your upcoming wedding. 1/20; f/6.3; ISO 1250; 14.0 mm.